Amanita subjunquillea, also known as the East Asian death cap is a mushroom of the large genus Amanita, which occurs in East and Southeast Asia. Deadly poisonous, it is a member of section phalloideae and related to the death cap A. phalloides. Initially little reported, the toxicity of A. subjunquillea has been well established; a study in Korea revealed it to have similar effects to A. phalloides, namely delayed gastrointestinal symptoms, hepatotoxicity and a 12.5% mortality. The species killed five people out of six who ingested them in Hebei, China in 1994. 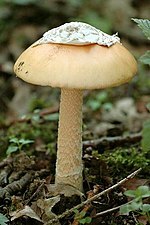 An all-white variety, Amanita subjunquillea var. alba is known from southwestern China, Japan and Northern India.